My Veteran was born in Weir, Mississippi on a winter morning in the late 1920s (There are no “Frosty Morns” in that part of Dixie). He was baptized Ludwig Armstrong Beckman III (LAB), the son of a Presbyterian Minister and grew up in the Great Depression. In 1945, while attending Jones County Junior College, his Spanish Teacher (and member of the local Draft Board) told LAB, “your number will come up this week for the Army!” LAB promptly caught a bus that afternoon to Jackson to talk to the Navy recruiters. He raised his hand, took the oath and after his Dad drove to Jackson to bring him a change of clothes and his toothbrush, was off to Navy Basic Training. LAB spent his Navy tour as a radar operator at Argentia, Newfoundland (lots of frosty morns there), and rose to the exalted rank of Petty Officer 3rd Class before mustering out in 1947. LAB took advantage of the GI Bill and attended Mississippi State University. When the Korean War broke out, he stayed in ROTC and was commissioned an Artillery Officer upon graduation in 1951. 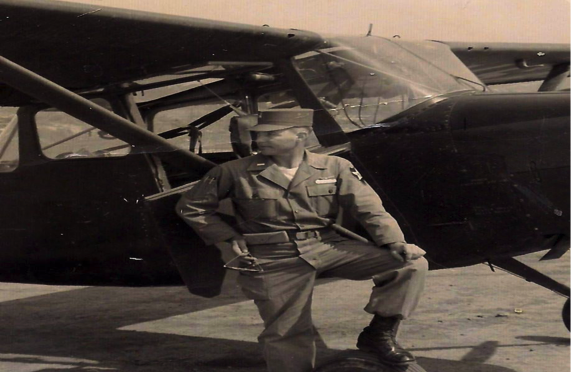 While training at Ft. Bliss someone asked, “who wants to be a pilot?” Before long, LAB had earned his wings and found himself flying a L-19 artillery observation plane over the (still very hot) Korean DMZ in 1953. LAB ignored his Mom’s advice to “fly low and slow,” survived his tour and went to Ft. Sill to learn to fly helicopters (where he also met and married his wife). After several years of flying in Italy, New York and Alabama, LAB put his Accounting Degree into practice by joining the Finance Corps and in April 1965 he found himself in Saigon, South Vietnam. Two days before he was to fly home in April 1966, the Viet Cong drove a truck bomb into his hotel. He survived, but LAB knows exactly what Iraq and Afghanistan Vets feel about VBIEDs. After 21 years of service, LTC Beckman retired from Active Duty, but he didn’t stop serving. He spent over twenty-five more years as a 5th grade teacher and serving his church and community in Lawton, Oklahoma. Along the way, LAB had two sons, one of whom recently retired as an Army Colonel, and he is the grandfather of two Army Captains. Like so many of his generation, LAB answered the call, served proudly in peacetime and war, and when his military service ended, worked to make his community and nation a better place. My Veteran, is now really retired and living large in Little Rock, Arkansas. This quiet hero, from the Greatest Generation, has gone by many names and titles, but I’m proud to call him Dad.